Rose the Irish Setter and Kate the English Springer Spaniel, best friends for more than a decade, discovered several years ago that they had an amazing talent: they can blog. 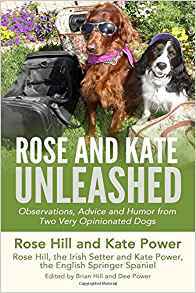 Since then, they have been writing down their observations, experiences and fun times and now they are ready to share them with you in their brand new book, "Rose and Kate Unleashed." While "Rose and Kate Unleashed" is appropriate for any age it is not a children's book. Photos are in black and white in the paperback format. Rose and Kate's two-legged companions, Brian and Dee, have been on these adventures every step of the way and helped Rose and Kate translate their dog vocabulary so humans will understand. For Kate, for example, "the sucky-uppy thing" is the vacuum cleaner. And the "tappity thing" is the computer keyboard. Dogs see the world much differently than people do and in this book they open up their world for us to see, with all its excitement and humor and vibrant color. They are special girls who bring joy to everyone they meet through their bright and exuberant personalities. Rose is a bit edgy and vain about her beautiful red looks, Kate is a bit wacky, with an attention span of about 5 seconds.